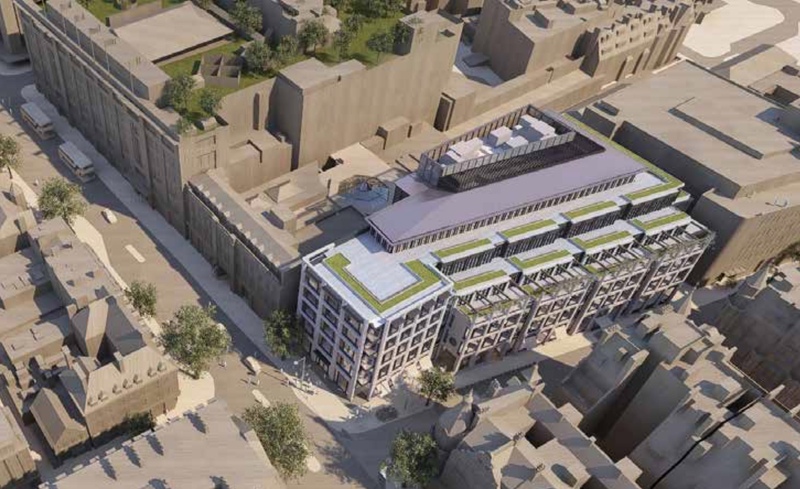 The new building (right) will be one floor higher towards Kensington High Street, but along Wrights Lane much of it will appear lower, as floors three and four will be stepped back with landscaped terraces in front. The flower stand at the corner will remain. Pictures courtesy of Pilbrow & Partners. The largest redevelopment around Kensington High Street station since the mid 1970s was approved by the council’s planning committee on Thursday 14 December – and it happens to be the same site again: 127 Kensington High Street & 15 Wrights Lane, commonly known as “the Boots building” (as Boots is the largest tenant), which was built in 1977-78, and the detached “cake slice” pavilion currently occupied by Caffè Nero (added in 1999). The new complex will retain parts of the core of the existing building, thus making the redevelopment much quicker and less disturbing. The work is estimated to take 18 months from start to finish, instead of the 24-28 months it would have taken to demolish and rebuild everything. Just as now, it will be a building for retail and offices only. The total floor area will increase from 11,475m² to 15,605m², with more offices and less retail compared with today. The complex will basically be one floor higher than today, meaning five floors facing Kensington High Street, plus another floor on top that is set back so it isn’t visible from street level. However, along Wrights Lane only the first three floors will be fronting the street, as the two floors above will be stepped back with landscaped terraces in front, which will actually make it seem lower than the current building. One major feature will be an arcade between Wrights Lane and the Kensington Arcade nave outside the tube station. 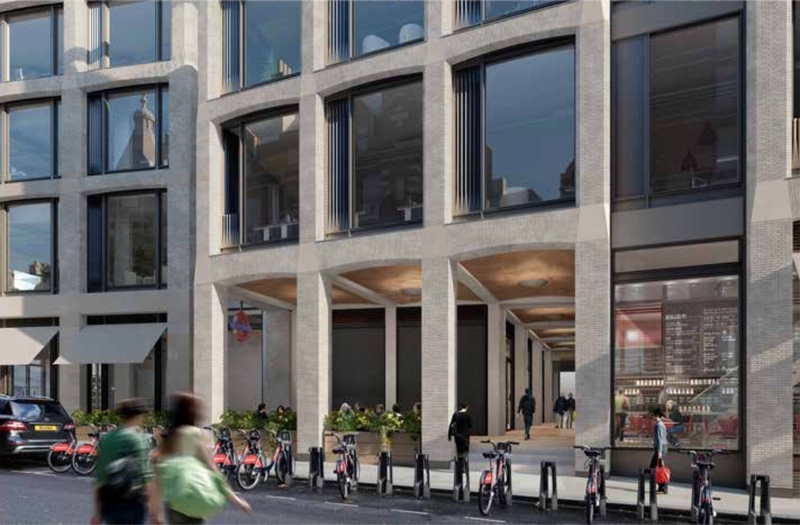 At the moment, entrance to the tube station from Wrights Lane is through Boots, but the new arcade, which will split the ground floor in two and go in an angle towards the tube station, will be independent of the retailers on either side and will stay open as long as the tube station is. 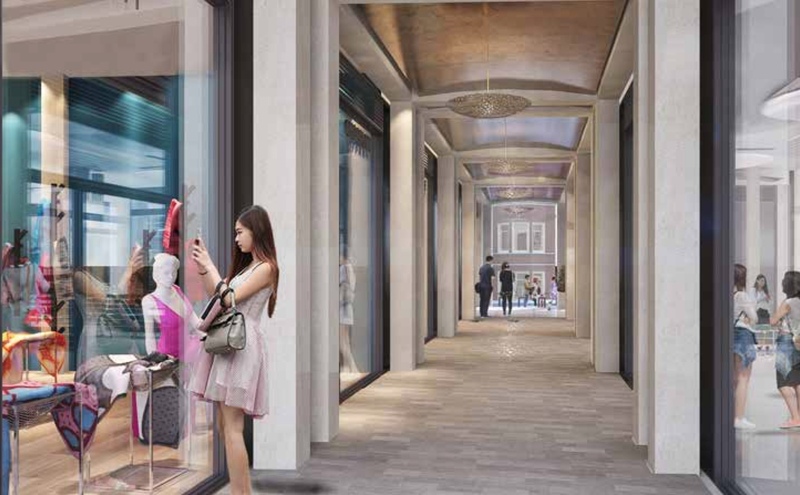 After the redevelopment, Boots will move into the High Street part of the ground floor and will also occupy the whole basement, while half of the ground floor on the other side of the arcade will be let to a mix of small shops, cafés and restaurants. The remaining ground floor will become part of the new office building (i.e. 15 Wrights Lane). Provisions are to be made to allow Boots limited operation within the building during the building works. The flower stall in the corner of Kensington High Street and Wrights Lane is also to remain, as will the cycle hire stand along Wrights Lane. All floors above ground floor will be offices only. The plans for this development, by American-owned Columbia Threadneedle Investments, have been discussed with the planning department’s officers since February 2015. Originally, the developer wanted to turn a large part of the site into luxury flats, but the planning officers convinced them that the loss of offices would be strongly resisted, so when the application was finally submitted in March 2017, it was for a retail and office building only. A decision from the council’s planning committee was initially planned for early July, but the application didn’t come up on the planning committee’s agenda until 23 November. At that meeting a number of concerns were raised, but instead of refusing the application the committee decided to defer the decision to a later meeting in order to allow the developer to revise the proposal. So on 14 December the committee looked at the proposal again and was satisfied with the late changes. The main visual difference between the November application and the approved version, is that the very noticeable large pergolas above the second floor on the Wrights Lane side will be removed. They were felt to make the building top heavy, as they gave the illusion of four floors straight up from the street instead of three. Another big difference is that the developer has agreed to increase the contribution towards public realm improvements from £60,000 to £460,000, as the committee members at the November meeting felt that the proposed contribution was much too small. There will also be some restrictions on when the office terraces can be used, to lessen the sense of overlooking for residents living on the other side of Wrights Lane. The plans have been heavily criticised by Warner Music, who have both their UK headquarters and a large recording studio in the next building, 27 Wrights Lane. Currently. The reception and some of Warner Music’s north-facing offices currently have an unobstructed view all the way up to Kensington Church Street, but the new building will block that view on five floors. The company has also expressed fears that the noise from the building works will make their music studio unusable during the development. In a letter to the planning committee members a few days before the November meeting, one of Warner Music’s senior directors, Nick Cullen, head of international real estate and facilities, expressed his dismay that nobody had addressed the company’s concerns and demanded that strict conditions with specified noise limitations should be applied to any approval. However, among the proposed conditions in the officer report before the December meeting, there is no mentioning of noise restrictions, so it’s doubtful that any such conditions will be part of the formal approval when it is published. In an article in the Evening Standard the day before the November meeting, a spokesperson for Warner Music said that the company would consider leaving Kensington if the application was allowed. Once upon a time, before the arrival of the underground in the 1860s, this site consisted of four narrow buildings along High Street, with the grand but forlorn mansion Scarsdale House immediately behind them. In 1873, Ponting Brothers, drapers from Gloucester who already had two small stores in the Westbourne Grove area, took over one of those four buildings and then quickly expanded, so by 1893 they had all four buildings plus Scarsdale House and its grounds. By 1901 they had replaced the four front buildings with a purpose-built department store, which from 1907 had its own entrance from within the then rebuilt station, just like the department store on the other side of the station, Derry & Toms (today’s M&S). However, the quick expansion had overstretched the company finances, so in 1907 it was taken over by John Barker and Company, the parent company of Barkers, the largest department store on Kensington High Street. Pontings retained its name, however, and continued to be run independently from Barkers. Derry & Toms was also taken over by the Barker empire in 1920, following the financial slump after World War I. In 1957, House of Frazer bought the John Barker empire and began dismantling it. The first victim was Pontings, which was closed in 1970. After having been run as the Kensington Superstore for a few years, the building was demolished in 1976 and replaced by the current building. Anyone wishing to learn more about this application can click on this link to the council’s planning website. The architect’s model of the new complex, made before the third floor pergolas on the Wrights Lane side were removed. The sixth floor, so far set back that it’s only visible from the air or higher buildings, is an office penthouse. Picture courtesy of Pilbrow & Partners. 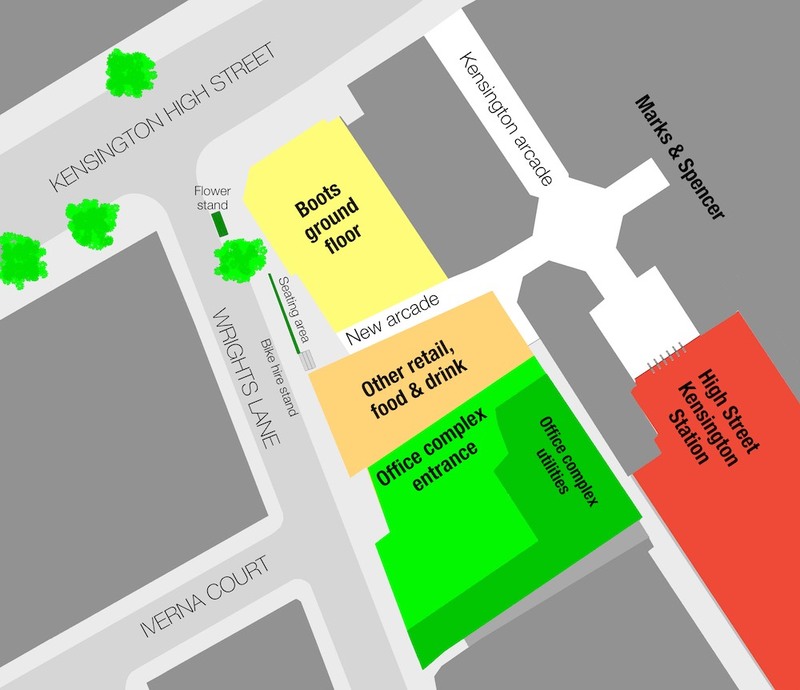 On ground floor, the site will effectively consist of three buildings: Boots will occupy the floor fronting Kensington High Street (yellow), the floor on the other side of the new arcade will contain various shops and food & drink outlets (sepia), and the floor with a large Wrights Lane entrance (green) will contain the office lobby and one of the offices. All floors above will be offices, the basement underneath the whole complex will be a mix of shopping floor and storage for Boots, and parts of the mixed retail and food & drink area will have a mezzanine floor. The shopping arcade as it will look from Wrights Lane. There will be an outdoor seating area for the food and drinks customers to the left of the arcade. Picture courtesy of Pilbrow & Partners. What the arcade will look like from the Kensington Arcade nave, looking towards Wright Lane. Picture courtesy of Pilbrow & Partners. 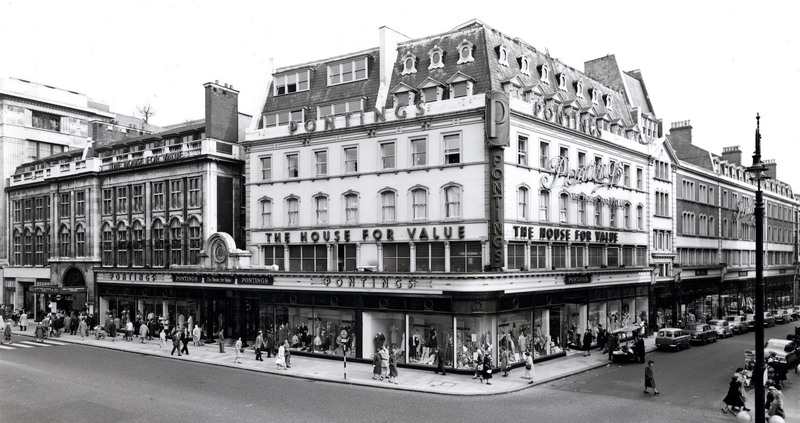 From 1901 until 1976, this was the site of Kensington’s third department store, Pontings. The department store covered half of the tube station building as well as the corner building and the buildings down Wrights Lane. This is what it looked like in the 1950s. Picture courtesy Kensington Library.